As with Peniche, Ericeira has no shortage of Atlantic swell to play with. Numerous classic reef set ups, rocky headlands and small rivermouth bays shape the swells into world class waves such as Coxos. Ericeira can be considered the centre of Portuguese surfing with its concentration of classy breaks a mere 30km from Lisbon. It doesn’t quite have the wind protection of Peniche and big, stormy swells tend to favour the south-facing coast of Lisbon, but for consistent quality and challenging waves, Ericeira rules. Ericeira is the Mecca of Portuguese surf and like Peniche, it offers a truly staggering variety of waves, crammed into just a few kilometres of coast. There’s something to suit every standard but unlike Peniche, most of these waves are rock bottomed and there is little wind or swell shelter. Coxos is the best known wave, a long, hollow world class right, but sitting proudly next to it in the quality stakes are the barrels of Pedra Branca and Reef. Such high class waves attract crowds and with Lisbon only a short drive away there are no shortages of surfers wanting a piece of Ericeira action. 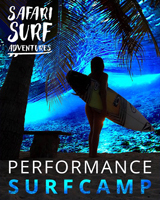 This lively and attractive town is a year round surf destination with the beach breaks to the south of town being the best bet in the small summer season and the reefs and points the main event for the remainder of the year. Ericeira’s swell and wind synopsis is identical to Peniche, but the wind options are less flexible. All the breaks require E or even SE winds for due offshore so the summer Nortada is obviously bad news. Winter storms can mean some driving around to find places offering shelter from the wind and swell, which means Peniche or Lisbon. Autumn with its more easterly airflow is the best bet, but Ericeira can turn it on at any time of the year. Low tide can be suicidal on some reefs. The climate in Portugal is very pleasant year round. Ericeira and Peniche are in the middle of the country, stuck between the dry Algarve and the damp regions north of Porto. The wettest season starts in November and lasts until March-April, and there is even snow in the Serra da Estrela (the snow resorts are only reliable in February). The best climate occurs during the change over seasons, even though mid-summer rarely gets too hot on the coast. The Nortada (north winds) always cool things down and conspire with the cold Canarian Current to prevent the water from ever reaching boardshorts temperature. A light 2/2 or 3/2 steamer will do except in mid-winter when a 4/3 and boots are necessary. Ericeira is a typical fishing/tourist town with pastelerias, pretty streets and churches. It’s lively year round because of its proximity to Lisbon, but still fairly low key. A Saturday night out in Lisbon’s Barrio Alto district can be interesting, as thousands of people pour onto the streets to drink themselves stupid. Don’t miss Sintra, and the majestic castles of the old Royal City nearby. The rocky ledges and reefs are more dangerous than the locals are but the area is getting increasingly overcrowded. Some of the remote car parks are tempting for thieves. Sitting out storm surf conditions is a regular occurrence. There are a couple of surf shops in Ericeira town. Semente Surfboards in Ribamar is Portugal’s biggest board shaper. The factory shop stocks boards costing around $180. Bodyboarders in Portugal outnumber stand up surfers in most line-ups, except for Coxos and Ribeira d’Ilhas. 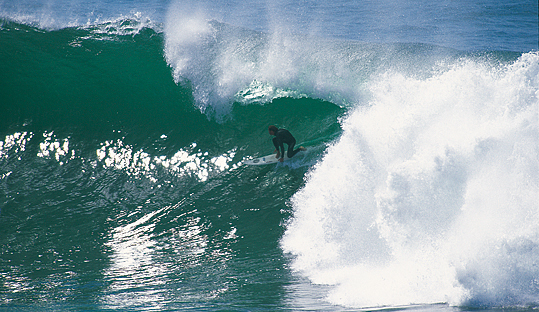 Peniche and the legendary Supertubes are one hours drive to the north. There are plenty of automatic cash dispensers throughout the country.